Intelligent, down to earth, with a good sense of humor, Rabbi Dean Kertesz returns to his roots as Rabbi at Temple Beth Hillel. Rabbi Kertesz grew up at Temple Beth Hillel, attended religious school, became a Bar Mitzvah and was confirmed at our temple. Many older members share stories of Dean as a child and young man. Rabbi Kertesz’s education reflects his commitment to Jewish learning. He has a Bachelor of Arts Degree in American History from Reed College. In the early 1990’s he studied at The Center for Jewish Studies at the Graduate Theological Union in Berkeley. He lived in Israel in the early 1980’s and again with his family from 1992 through 1994. He was a Wexner Heritage Foundation Fellow – a national Jewish education program for Jewish leaders – from 1996 through 1998. 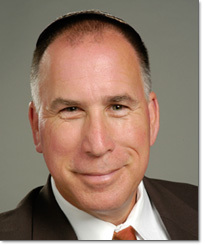 He began the Rabbinic Program at the Academy of Jewish Religion in Los Angeles in 2002 and received ordination in Spring 2007. We have a great Rabbi, a great Cantor, and nice interesting people. Rabbi Kertesz has been an active volunteer at Congregation Netivot Shalom in Berkeley for a number of years, often filling in for the rabbi leading services, teaching, and facilitating life cycle events. He lives in El Cerrito, with his wife Carla, an acupuncturist, and their two children, Simone and Avi. When asked what Rabbi Kertesz was passionate about he said, “Serving God and the Jewish people by helping to nurture a community that is open to all, cares about one another and is seriously committed to increasing Jewish learning and spiritual practice.” We welcome him as our Rabbi.